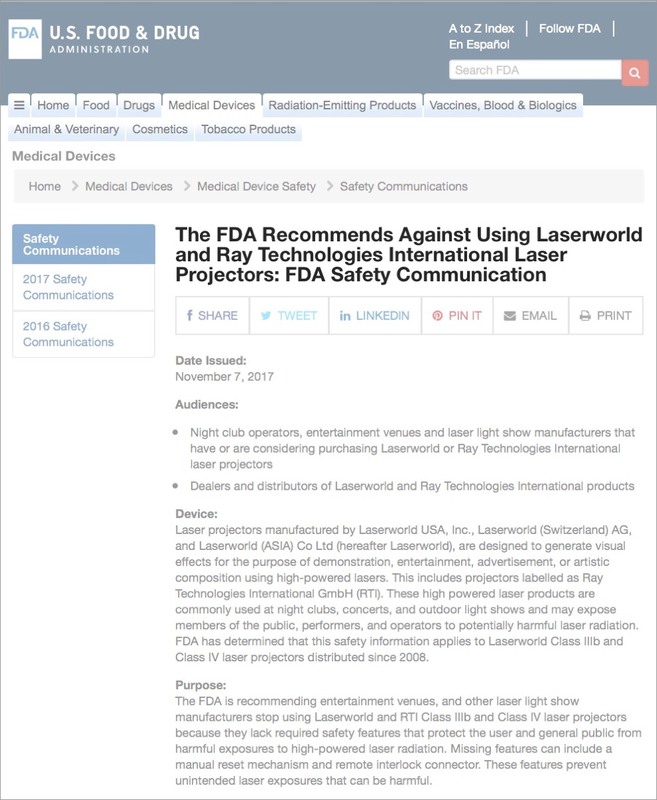 ILDA is aware of the U.S. Food and Drug Administration’s November 7, 2017 Safety Communication which recommends against using Laserworld and Ray Technologies International (RTI) laser projectors. As per the FDA recommendation, U.S. laser shows that use Laserworld and RTI projectors may possibly not be able to use these projectors in their shows. We have the following guidance for ILDA Members and others who are doing laser shows in the U.S. with Laserworld and RTI laser projectors. 2) Some Laserworld or RTI projectors manufactured between 2008 and July 1, 2015 may not have all required features. Such features are found in U.S. 21 CFR 1040.10. According the FDA’s safety communication, “Missing features can include a manual reset mechanism and remote interlock connector.” Projectors with missing features will need to be recertified as described below. Can I do a U.S. laser show with a noncompliant projector? At this time, all noncompliant Laserworld and RTI projectors do not have a valid variance (e.g. manufacturer’s variance) for use in a U.S. laser light show product (e.g. an FDA-varianced laser light show.) Laserworld projectors may have been manufactured under an active variance, prior to July 1, 2015, yet may still be noncompliant, due to a missing manual reset mechanism for example. A noncompliant Laserworld or RTI laser projector can be corrected and reported in order to bring it into compliance. 1) The first step is to evaluate whether the projector has all required features, and to install or fix any missing or noncompliant features. 2) The second step is to report the corrected projector to FDA. This is done using the same forms and procedures as a newly manufactured laser projector. This process also includes having an acceptable quality control program to ensure the projector has all required features. Once the report is submitted to FDA, the projector may be legally used in an FDA-varianced laser light show. In conclusion, ILDA recommends to U.S. laser light show variance holders who have noncompliant Laserworld or RTI projectors that they bring the projectors up to compliance with the required modifications, document these modifications, and report them to the FDA. It may be easier to have an existing laser manufacturer bring a projector into compliance and submit the required reporting to FDA. If you have any additional questions on how to take corrective actions, contact FDA through the resources listed in their Nov. 7, 2017 Safety Communication. This webpage will be updated if new information becomes available. “Laserworld strives to create the safest lasers possible. In order to guarantee all global and local regulations are fulfilled, we have hired multiple third party consultants worldwide that externally certify each single product. The same applied for the USA. “I can personally assure everyone outside the USA that none of the matters raised by the FDA are of any relevance for you at all. For the avoidance of doubt I’m happy to disclose safety aspects related company data of your specific product you purchased from us or give contact information to other users in the world that can share their experiences with you. For the full statement, plus additional information from their perspective, visit Laserworld’s special website www.cdrh.info.